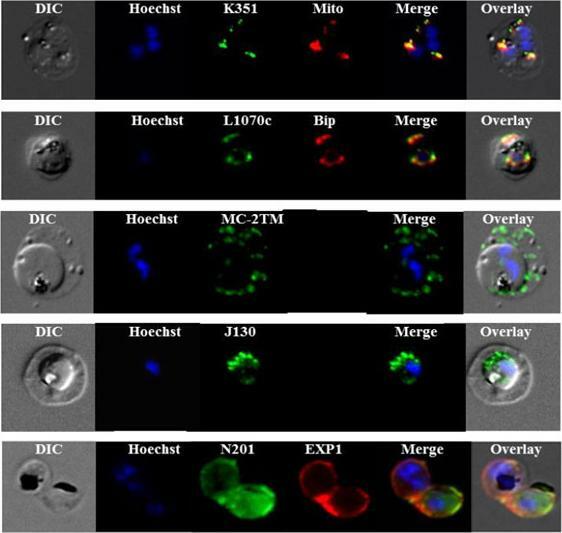 Immunoelectron micrographs of young trophozoite-, late trophozoite-, young schizont-, and late schizont-infected erythrocytes reactive with rabbit antisera against PfMC-2TM peptides, 703, 705, and 713 (identical sequences in all PfMC-2TM-coding genes and Mab SP1A6 against the 130 kDa Maurer’s cleft protein. a–c Peptide-specific antisera are reactive with the PV/PVM and weakly around clefts. d–f Mab SP1A6 is reactive with structures within the parasite in young trophozoites, probably the endoplasmic reticulum (d), late trophozoites in erythrocyte cytoplasm under knobs (e), and in young schizonts around longitudinal clefts in the erythrocyte cytoplasm (f).Tsarukyanova I, Drazba JA, Fujioka H, Yadav SP, Sam-Yellowe TY. Proteins of the Plasmodium falciparum two transmembrane Maurer's cleft protein family, PfMC-2TM, and the 130 kDa Maurer's cleft protein define different domains of the infected erythrocyte intramembranous network. Parasitol Res. 2009 104:875-91. Copyright Springer 2011. A. Immunofluorescence assay of rabbit antisera against PfMC-2TM peptides colocalized with anti-SERA 1 antibodies. Arrows indicate areas of colocalization between SERA 1 andPfMC-2TMB. Mouse antisera against MAHRP1 MAL13P1.413 was incubated with antisera against PfMC-2TM peptides.C. 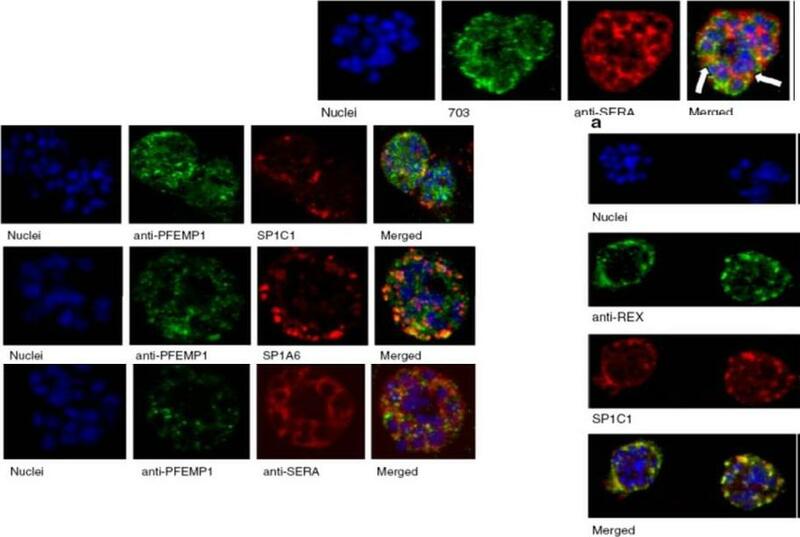 Immunofluorescence assay of rabbit antisera against PfEMP1 with Mabs SP1C1. PfEMP1 colocalized with PfMC-2TM, D. Immunofluorescence assay of rabbit antisera against REX1 PFI1735c colocalized with Mabs SP1C1. Optical sections were collected at a step size of 0.5 μm from the top to the bottom of the optical plane. Continuous overlap of the antibodies was observed.Tsarukyanova I, Drazba JA, Fujioka H, Yadav SP, Sam-Yellowe TY. Proteins of the Plasmodium falciparum two transmembrane Maurer's cleft protein family, PfMC-2TM, and the 130 kDa Maurer's cleft protein define different domains of the infected erythrocyte intramembranous network. Parasitol Res. 2009 104:875-91. Copyright Springer 2011. 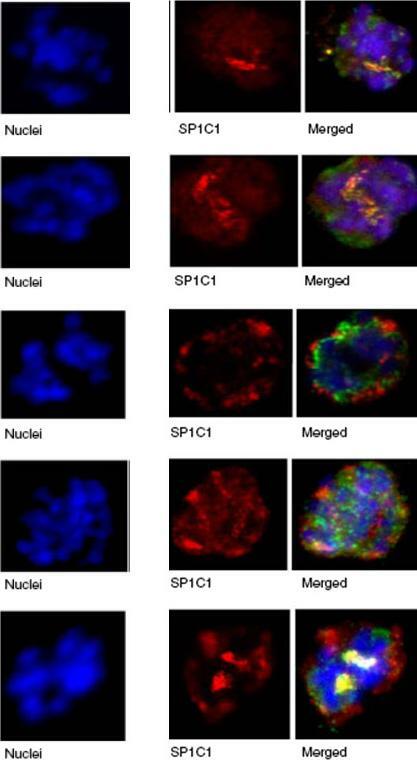 Immunofluorescence assay of rabbit antisera against PfMC-2TM peptides colocalized with Mab SP1C1. Immunofluorescence assays (IFA) in this figure and Figs. 4, 5, 6, 7, 8, and 9 were performed using the same stage of parasites. 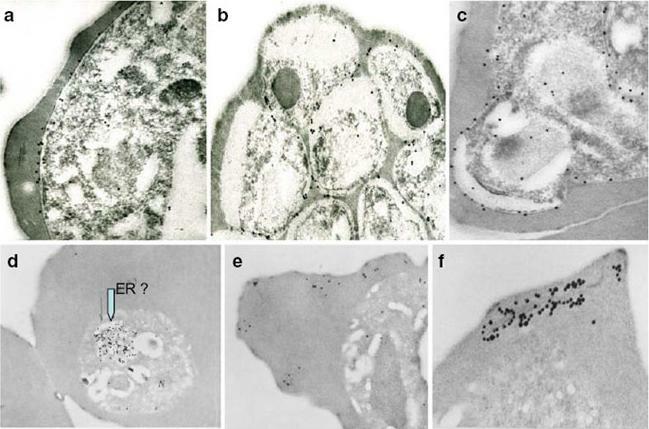 Trophozoite- and schizont-infected erythrocytes were incubated with mouse and rabbit primary antibodies, followed by secondary antibodies directed to both species, conjugated to different colored fluorochromes; Alexa 488 and Alexa 568 (Molecular Probes) for detection of primary antibodies. Antibody staining was considered colocalized if there was overlap (yellow/orange) in the staining pattern obtained with the two antibodies on or within the same structure or within domains of the intra-membranous network.Tsarukyanova I, Drazba JA, Fujioka H, Yadav SP, Sam-Yellowe TY. Proteins of the Plasmodium falciparum two transmembrane Maurer's cleft protein family, PfMC-2TM, and the 130 kDa Maurer's cleft protein define different domains of the infected erythrocyte intramembranous network. Parasitol Res. 2009 104:875-91. Copyright Springer 2011. 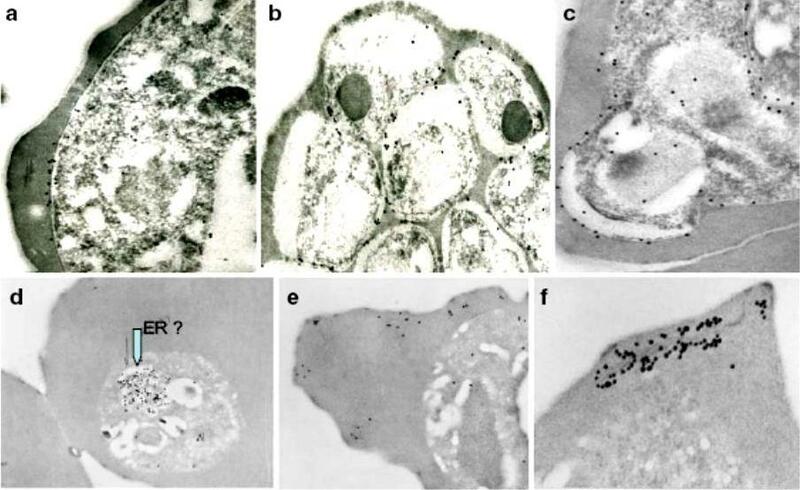 Immunoelectron micrographs of young trophozoite-, late trophozoite-, young schizont-, and late schizont-infected erythrocytes reactive with rabbit antisera against PfMC-2TM peptides, 703, 705, and 713 and Mab SP1A6 against the 130 kDa Maurer’s cleft protein. a–c Peptide-specific antisera are reactive with the PV/PVM and weakly around clefts. d–f Mab SP1A6 is reactive with structures within the parasite in young trophozoites, probably the endoplasmic reticulum (d), late trophozoites in erythrocyte cytoplasm under knobs (e), and in young schizonts around longitudinal clefts in the erythrocyte cytoplasm (f).Tsarukyanova I, Drazba JA, Fujioka H, Yadav SP, Sam-Yellowe TY. Proteins of the Plasmodium falciparum two transmembrane Maurer's cleft protein family, PfMC-2TM, and the 130 kDa Maurer's cleft protein define different domains of the infected erythrocyte intramembranous network. Parasitol Res. 2009 104(4):875-91. 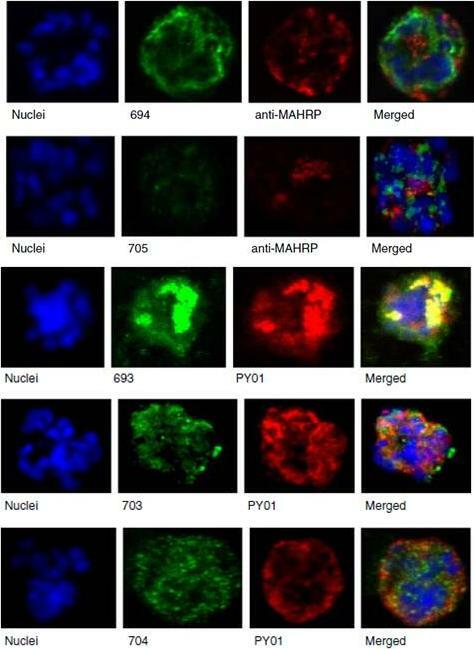 Upper row: Immunofluorescence assay of rabbit antisera against PfMC-2TM peptides colocalized with anti-SERA antibodies. Arrows indicate areas of colocalization between SERA and PfMC-2TM. 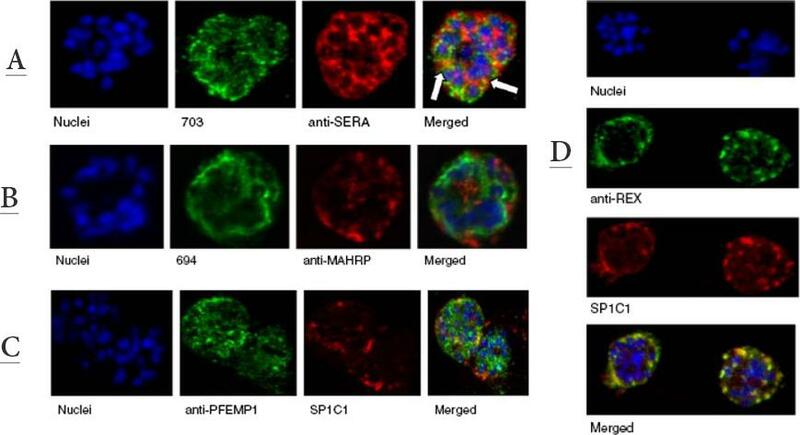 Left Panel: Immunofluorescence assay of rabbit antisera against PfEMP1 with Mabs SP1C1 (a), Mab SP1A6 (b), and anti-SERA (c). PfEMP1 colocalized with PfMC-2TM, the 130 kDa Maurer’s cleft protein and SERA. Right panel: Immunofluorescence assay of rabbit antisera against REX PFI1735c colocalized with Mabs SP1C1. Tsarukyanova I, Drazba JA, Fujioka H, Yadav SP, Sam-Yellowe TY. Proteins of the Plasmodium falciparum two transmembrane Maurer's cleft protein family, PfMC-2TM, and the 130 kDa Maurer's cleft protein define different domains of the infected erythrocyte intramembranous network. Parasitol Res. 2009 104(4):875-91. Upper panel: Mouse antisera against MAHRP1 was incubated with antisera against PfMC-2TM peptides and antisera. 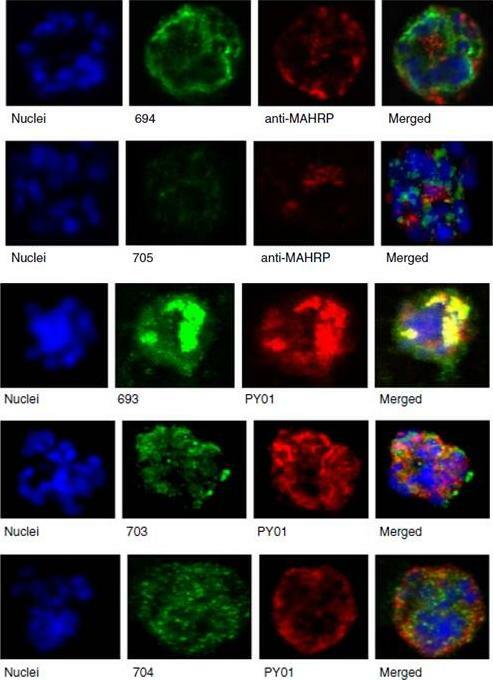 Lower panel: Immunofluorescence assay of mouse antisera against Rhop-3 (PY01) was incubated with rabbit antibodies against PfMC-2TM on smears of mature schizonts;Tsarukyanova I, Drazba JA, Fujioka H, Yadav SP, Sam-Yellowe TY. Proteins of the Plasmodium falciparum two transmembrane Maurer's cleft protein family, PfMC-2TM, and the 130 kDa Maurer's cleft protein define different domains of the infected erythrocyte intramembranous network. Parasitol Res. 2009 104(4):875-91.